The 10th acrylic panel to join the series! Introducing an acrylic panel of Shui from "Lamento -BEYOND THE VOID-!" 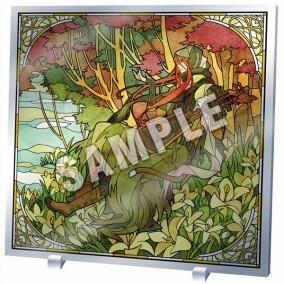 A stained-glass style reproduction of the original illustration by Uiro Yamada. It looks absolutely beautiful when illuminated from the back. Twice the size of every other panel in the series (length 320mm×width 320mm). * The same size as Leaks Ver. First released at the Nitroplus Online Store.